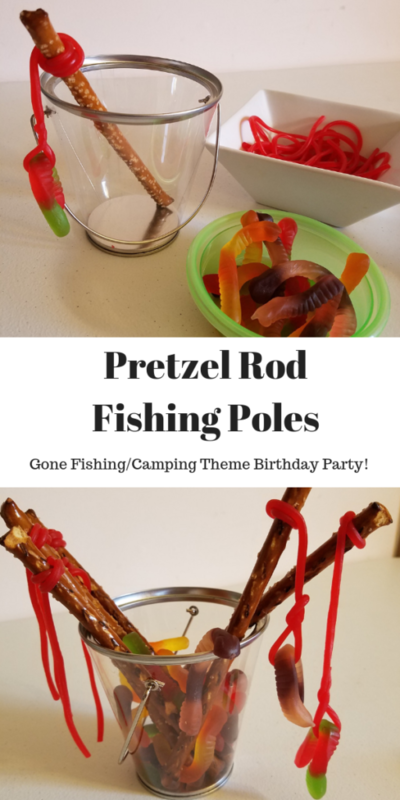 These Pretzel Rod Fishing Poles and Bait was a really fun snack/treat for a Gone Fishing/Camping Theme Birthday Party that we had last weekend for our son. He just turned 9 and that was the theme he chose for his party. 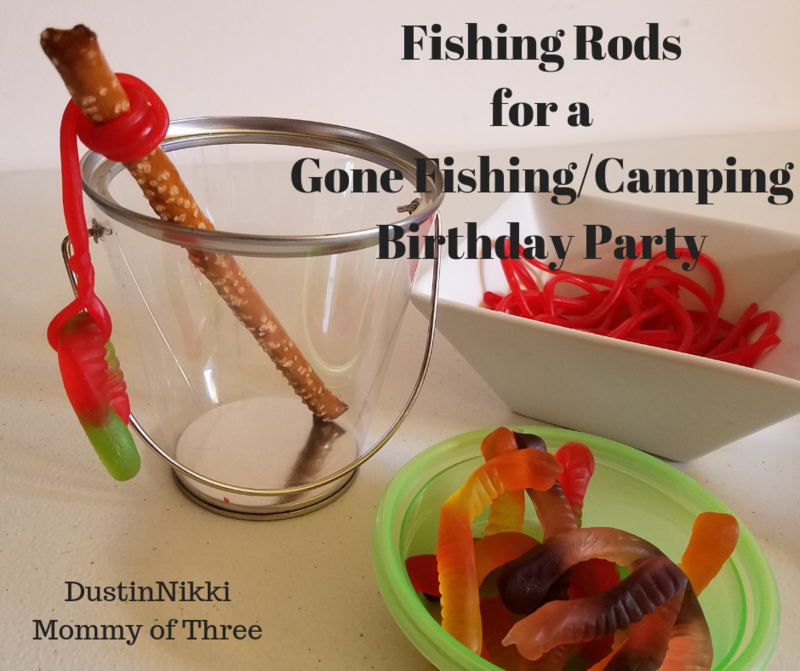 I got some help from pinterest for some fun themed snack/food options and these fishing poles was one of them. 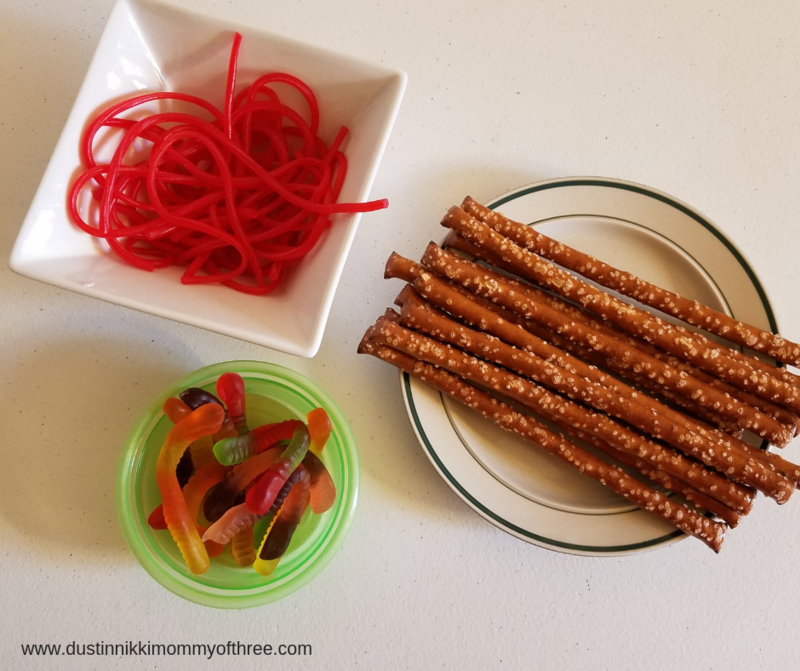 You will need pretzel rods, gummy worms, and pull apart twizzlers. At least that is what I used. I didn’t think about it at the time but I got some regular size gummy worms. I would strongly suggest using the mini gummy worms. I will explain why further down the post. These sound like such a simple and easy idea right? Well, technically they are but I did have some difficulty. First, take twizzler piece (after you pulled all the ropes apart) and wrap it around one end of a pretzel rod. At first I tried tying them on but that didn’t work out so well. I think if I used red licorice rope instead, I might have been able to a lot easier. Anyway, with the twizzler, I just wrapped it around the pretzel rod a couple times and then squeezed or pinched it together. The twizzler ropes stayed attached really well. I attached the gummy worm much the same way. I wrapped the twizzler around after making a loop around the gummy worm. Then I squeezed and pinched it together too. This also worked really well. 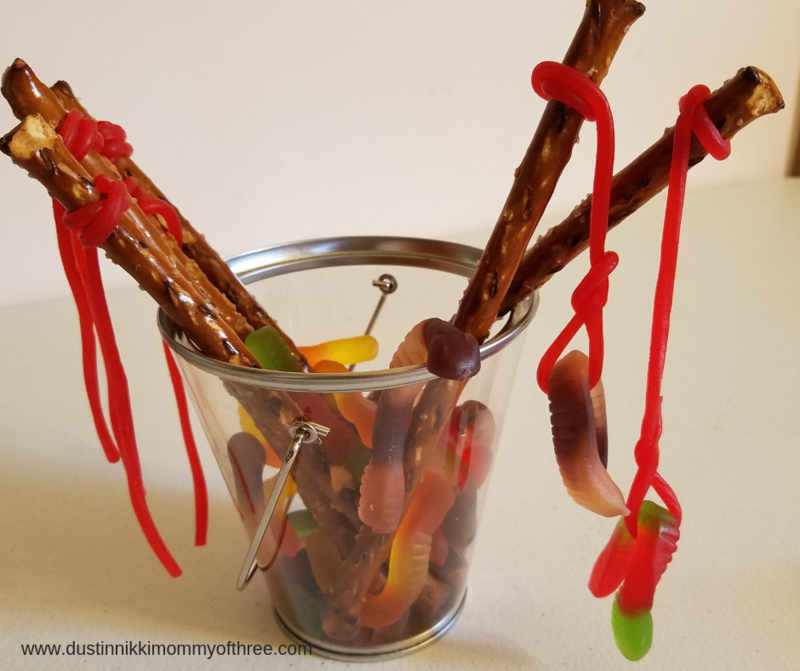 I didn’t have a problem with the twizzler rope coming off the pretzel rod or the gummy worm coming off the twizzler at the end. However, I did run into another problem. 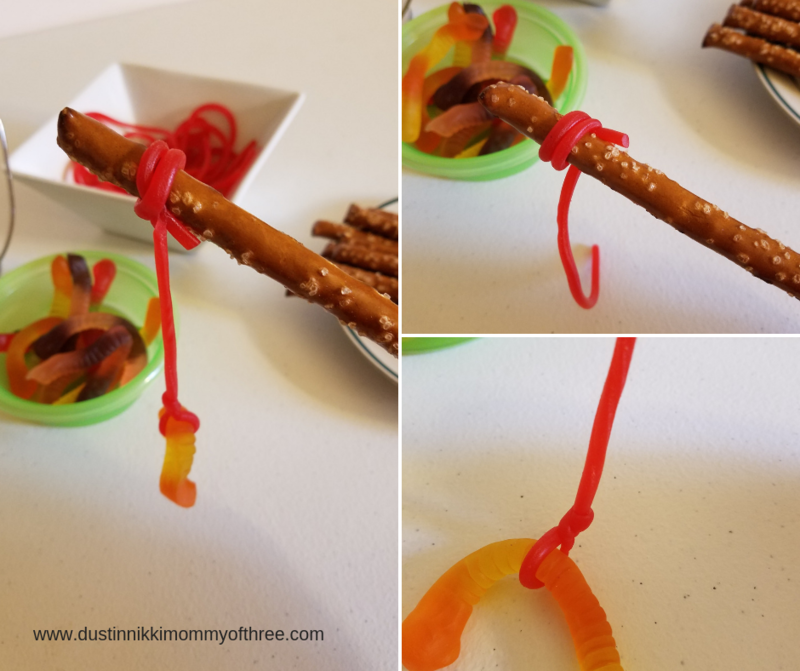 Since I used the bigger gummy worms, the weight of them eventually ended up pulling and stretching the twizzler ropes making the roped end up breaking down by the worms. This is why I suggested using smaller gummy worms so you don’t have this problem. Since my gummy worms were too heavy, I just made up a couple with worms right before the party for less of a chance of the ropes breaking. The rest of the rods, I just attached the twizzler ropes and put them in a clear bucket with the remaining worms. I bought the clear buckets at Walmart a while back for less than a dollar. 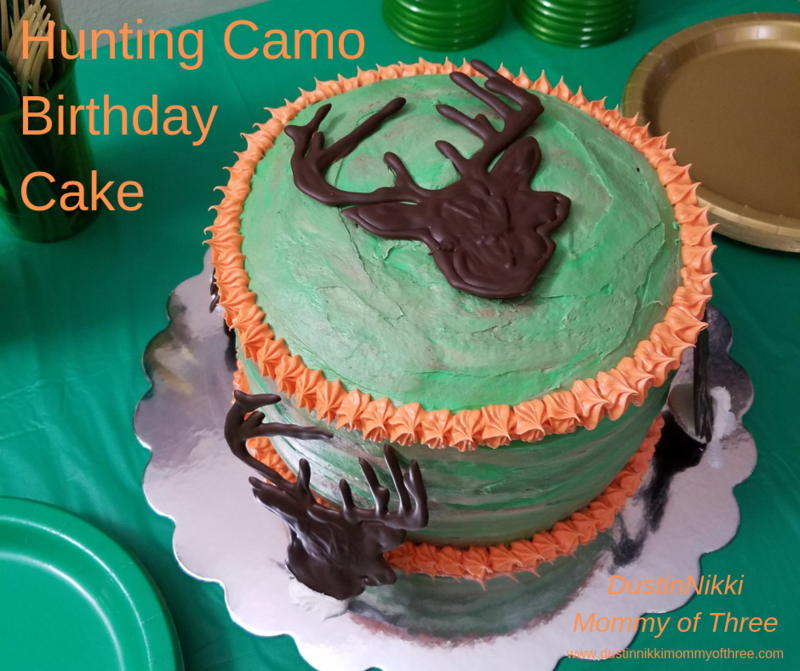 I have used them for our older son’s birthday party last year. On my tent card, I labeled this one Fishing Poles and Bait. 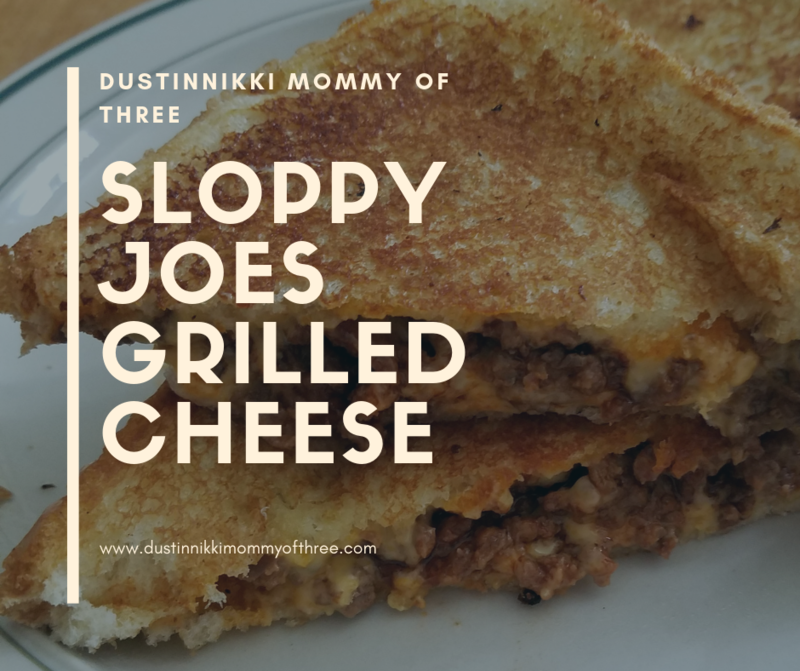 If you want to check out my DIY Gone Fishing/Camping Snack/Food Tent Cards post, follow the link! 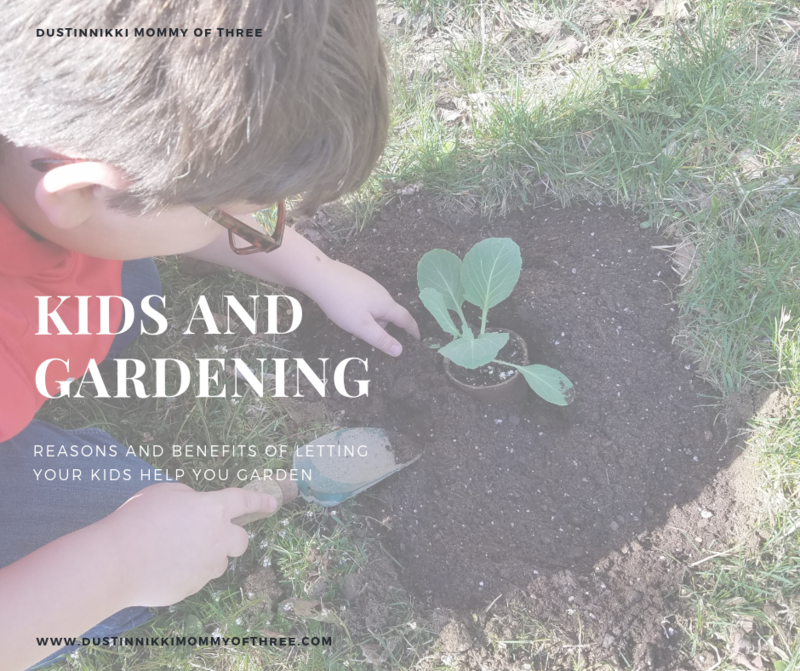 I will have a new post shortly with snack/treat/food ideas soon so keep a look out for it!